Session 411. We arrived at Frankston at 7am but there was no wind - the northerly was not coming in there. Stopped for a coffee and chat at Cafe Moto, then I had a look at Paterson River. The wind was picking up. I drove to Aspendale and could see wind action on the waves but it was a bit offshore so I drove down the Chelsea where the wind was cross-shore. It was good so I rigged up and set off. No other kites were out but there were some windsurfers. I took my waterproof backpack hoping to do a downwinder. I did a long run out then back to check out the wind. There was a lot of wind further out and less close to shore. 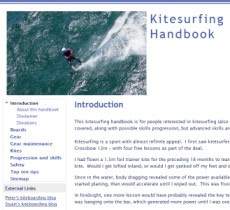 I alternated between surfing the swell with my kite lightly powered with speed runs and big jumps. Its really nice trying out different techniques and mixing up the styles. I saw some kites on the beach next to Seaford pier and went in for a look. The wind was light so a I tacked out again then surfed the swell into Frankston with some download turns as the wind strength dropped. Every downwinder is a good one! I packed my gear away then walked to the Frankston train station through the central area. A quick train ride took me back to Chelsea.